In what began as a single concert event in Seattle and has since evolved into a sort of traveling mini-version of Eric Clapton’s Crossroads Guitar Festival – both in terms of frequency and starpower, the Experience Hendrix tour rolled through Pittsburgh for the second time in three and a half years last Thursday night, setting the Benedum Center stage ablaze through an awesome display of rotating musicians – almost entirely guitarists – all paying tribute to one man, the incomparable Jimi Hendrix. With Hendrix just this month being honored by the U.S. Postal Service in the form of his own postage stamp and also serving as the subject of a much-anticipated upcoming motion picture (All is By My Side), it doesn’t appear likely that anyone will forget about Hendrix soon, something that the Experience Hendrix tour will also help ensure. 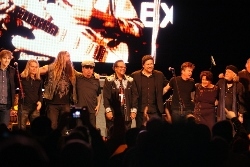 While a good number of the performers Thursday night were the same who visited Pittsburgh as part of the 2010 tour – Hendrix’s Band of Gypsys and Experience Hendrix bandmate Billy Cox (right), Aerosmith’s Brad Whitford, Kenny Wayne Shepherd, drummer Chris “Whipper” Layton (Double Trouble and Kenny Wayne Shepherd band), Jonny Lang, Los Lobos’ David Hidalgo and Cesar Rosas, and Eric Johnson among them – there were also quite a few new faces this time around, including Buddy Guy, Doyle Bramhall II, Eric Gales, Dweezil Zappa, and Zakk Wylde, with the Black Crowes’ Rich Robinson, Bootsy Collins, and Ana Popovic among the artists joining the tour on other dates. Billy Cox kicked off the evening – accompanied by the very Hendrix-looking guitarist Dani Robinson – with a funky “Stone Free” before bringing out Dweezil Zappa for the first time on “Freedom”. Dressed in black and gold attire and declaring himself a big Steelers fan, Eric Gales was the next to take the stage, providing vocals and guitar for “Foxey Lady” alongside fellow guitarists Mato Nanji (Indigenous) and a slinkily bodysuited Malina Moye. Eric Johnson followed, starting on “Power to Love”, then joined by Nanji and Kenny Wayne Shepherd band vocalist Noah Hunt for a rocking “Easy Rider”. Gales returned to accompany Johnson for a slow, John Mayer-ish take on “May This Be Love (Waterfall)” before being replaced by Zakk Wylde not on guitar but keyboards for “Are You Experienced”. His last night with the tour, Wylde then switched to guitar to help close out the 70-minute set with a deafening “I Don’t Live Today” and “Purple Haze”. After a brief intermission, Doyle Bramhall II (left) opened the second set in a much more subdued manner, starting with a solo acoustic version of “Hear My Train a Comin'”. Joined by the band and Nanji, Bramhall then moved to “Angel”, noting it as one he used to do with his band the Arc Angels (which also included Layton on drums as well as fellow Double Trouble member Tommy Shannon on bass and guitarist/singer Charlie Sexton), followed by “Gypsy Boy” and “In From the Storm”, assisted along the way by Hunt on vocals. Next, Los Lobos’ David Hidalgo and Cesar Rosas presented a few numbers, including a terrific “Little Wing” sung by Rosas, before Wylde returned to the stage accompanied by Brad Whitford and Jonny Lang on vocals and guitar for “All Along the Watchtower”. Upon Wylde’s exit, the band moved on to an electric “Fire” and a rocking “Spanish Castle Magic”. Kenny Wayne Shepherd was the next up, joined by Hunt on vocals and Nanji on guitar, hitting first on Electric Ladyland‘s “Gypsy Eyes”, followed by “Come On” and a lengthy but captivating “Voodoo Child” with some awesome solos from Shepherd. Cox, Nanji, and Buddy Guy took over from there, with Guy first doing some (as Hendrix used to describe it to him) “Muddy Waters stuff the Jimi Hendrix way” before Hidalgo and Rosas returned for a Rosas-sung “Hey Joe” and they capped off the night – and a nearly two-hour second set – with Cox taking the lead on “Red House”. There were of course plenty of great jams and solos throughout the program. Each of these performers is quite talented in his or her own right, but together – and with such a rich catalog of songs to choose from – they help make for a show that every music fan should be sure to experience. This entry was posted in Shows and tagged Billy Cox, Brad Whitford, Buddy Guy, Cesar Rosas, Chris Layton, Dani Robinson, David Hidalgo, Doyle Bramhall II, Dweezil Zappa, Eric Gales, Eric Johnson, Experience Hendrix, Jimi Hendrix, Jonny Lang, Kenny Wayne Shepherd, Malina Moye, Mato Nanji, Noah Hunt, Zakk Wylde. Bookmark the permalink.